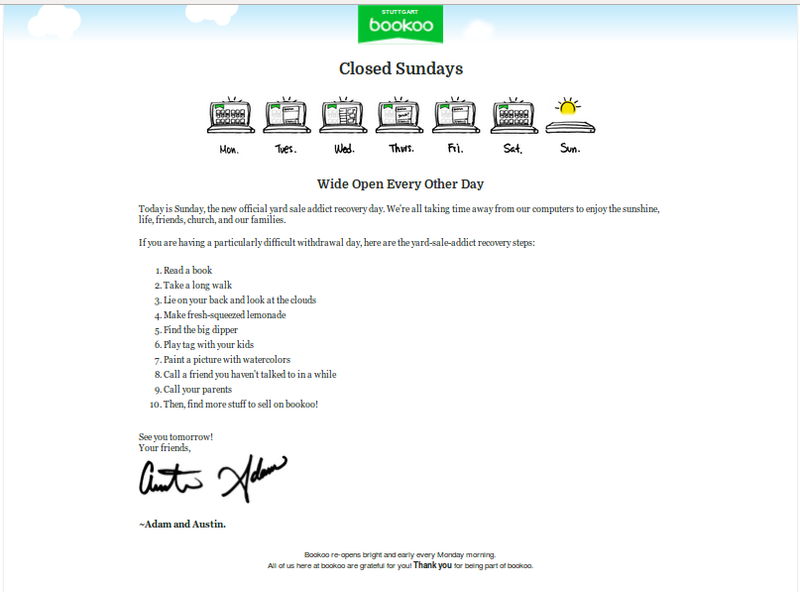 How many websites do you know that encourage their users to take their time away from computer, or similar devices, on every Sunday? I've never found one until today. So just few hours ago I accessed stuttgart.bookoo.com to check out something, then I'm quite disappointed because the website did not come out as expected. At first I thought it was in maintenance, or under construction, or something similar. But when I read the message carefully, I realized that they stop the service on purpose since they want their users to enjoy their life. We are talking about the real life here, in the real world. So they have a particular web-page, stuttgart.bookoo.com/sunday.jsp, in which you'll be redirected to when you access the website on Sunday. They even list some activities to give you some ideas... just in case you don't know what to do in the real world, which is pretty pathetic I think. For me this is interesting, I love this, and I really wish more websites do the same thing. We have to admit that people nowadays spend way too many times in computer, smartphone, tablet, for whatever reasons which make us have less time to interact with real people around us :( Wouldn't it be nice if facebook, twitter, instagram, yahoo, google, and youtube also do the same thing on every sunday? I think almost half people in this world then will be forced to do another activity without smart devices and internet. LOL.